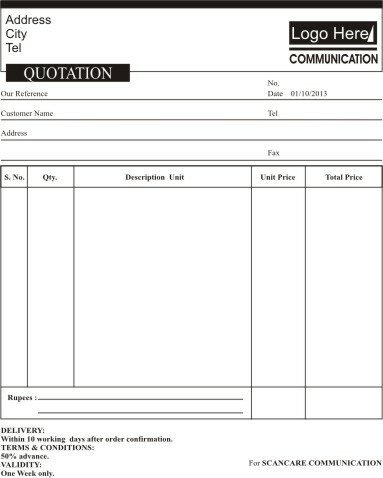 Quotation Format in Corel Draw and PDF Files for your office. This quotation can be used for multi-purposes within and outside the companies. This quotation is very good for shops, small business and after sales services. Sample quotation includes company logo, company name, address and telephone, numbers of the vendor and all the customer information like customer name, address, company and telephone numbers. In the main section it includes columns for serial number, quantity of the product/items, description of the products/items, unit price and than total price. In the end it also includes terms and conditions of the issued quotation like validity and order processing time, payment schedule, tax information, and the authorized signatures of issuing party.